This new award, created to recognize nurses who have made a difference in patient-centered care, has been generously funded by Nina Rumen. The award of $5,000 will provide financial assistance to a nursing student in a Doctoral Program in Nursing or Nursing related studies. 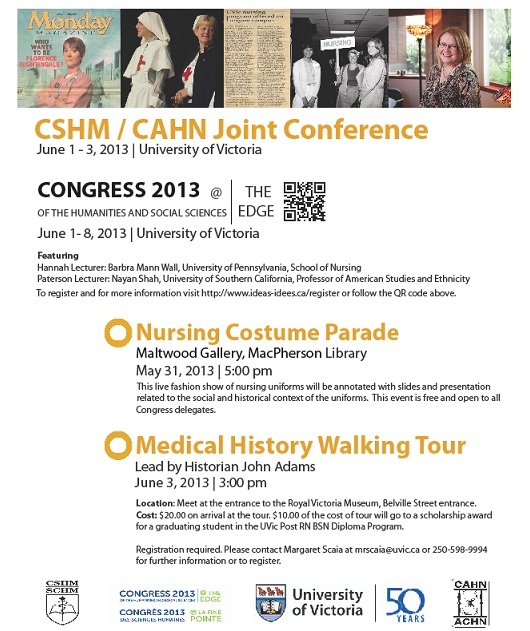 The application form can be found on the Resources Page and then click on “Student Resources” of this BC History of Nursing website. The deadline for submission of the application is November 15, 2013. Please visit website to view and read about the Costume parade. 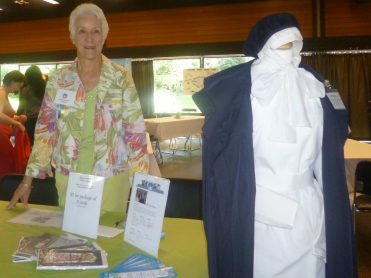 2013 BCHNS Nurses Week Activities were represented by Kathy Murphy at two events. Helen Shore presents Catherine Haney with the first BCHNS Helen Shore Award. 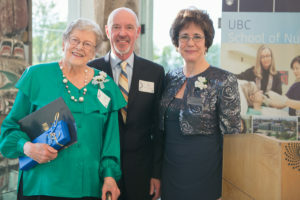 BCHNS is pleased to congratulate one of our founding members, Helen Shore who received one of two “UBC Nursing Partnership Awards” — given by the Director of the School. 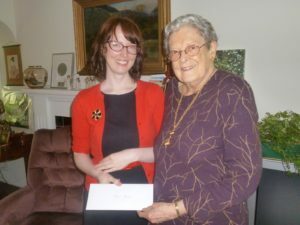 Helen received it for all her support to students and researchers in public health and community nursing through the Helen Shore Endowment Fund. 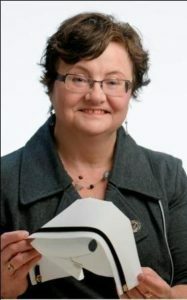 Our Sincere Congratulations Helen! 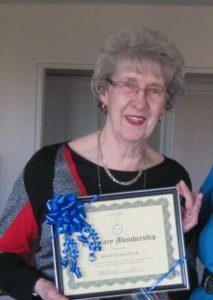 Please visit Online Exhibits and drop down to Honourary Members and click onto her name for the full write up. Congratulations to Dr. Geertje Boschma of the UBC School of Nursing. 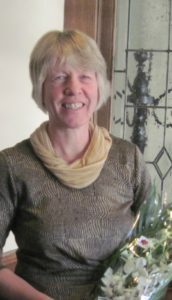 Geertje received a UBC Killam Teaching Award (one of three) given to UBC faculty who have been nominated by students, colleagues, and alumni for excellence in teaching. “They have been recognized by their students and peers alike as having created unique learning experiences for their students and sending them forward with life lessons and skills well beyond the core course material. They are truly making a difference in their respective programs”. Well done, Geertje! 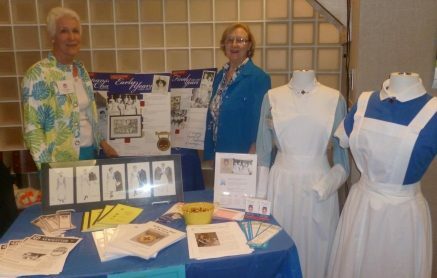 Christina Bates, curator emeritus in history at the Canadian Museum of Civilization, has written a new book, A Cultural History of the Nurse’s Uniform. This first and only in-depth analysis of the attire worn by the largest workforce in the health care system explores the role of the nurse’s uniform in creating nursing identity for over a hundred years. Watch for a review of book in a future BCHNS Newsletter! online: (cyberboutique.civilization.ca) or by phone: (819-776-8387 or 1-800-555-5621). 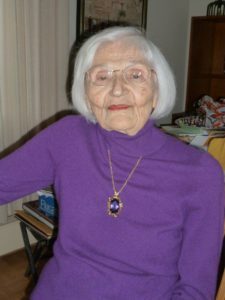 A service to celebrate Helen Mussallem’s life will be held at West Point Grey United Church, 8th and Tolmie, on Saturday January 12th at 1 PM. In lieu of flowers contributions may be made to the Canadian Nurses Foundation, 50 Driveway, Ottawa ON, K2P 1E2.